"It turns out that if you analyze the biochemical properties of RNA-binding proteins you see it's not just TDP-43 but several others that are also perturbed," says Aaron Gitler, a genetics professor at Stanford University who discusses the study in the same issue of eLife. "This is a new concept in how we think about these diseases – not just as TDP-43 diseases, but as RNA-binding protein diseases." On a hunch that a similar pattern might show up in mutation-free patients, who represent a majority of ALS and frontotemporal dementia cases, Conlon and her colleagues in the current study analyzed the brains of 50 people who had died with one or both diseases. 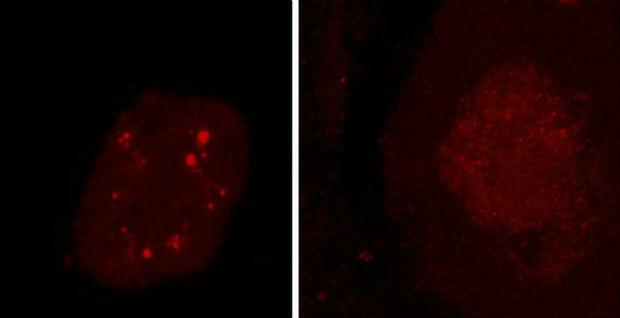 To their surprise, in more than half of the brains, they found large amounts of biochemically insoluble hnRNP H and three other RNA-binding proteins –TDP-43, FUS and hnRNP A1– indicating all had stopped regulating gene expression.